Few cinematographers have had as decisive an impact on the cinematic medium as John Alton. Best known for his highly stylized film noir classics "T-Men", "He Walked by Night", and "The Big Combo", Alton earned a reputation during the 1940s and 1950s as one of Hollywood's consummate craftsmen through his visual signature of crisp shadows and sculpted beams of light. No less renowned for his virtuoso color cinematography and deft appropriation of widescreen and Technicolor, he earned an Academy Award in 1951 for his work on the musical "An American in Paris". 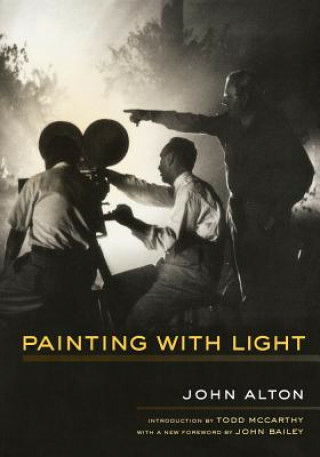 First published in 1949, "Painting With Light" remains one of the few truly canonical statements on the art of motion picture photography, an unrivaled historical document on the workings of postwar American cinema. In simple, non-technical language, Alton explains the job of the cinematographer and explores how lighting, camera techniques, and choice of locations determine the visual mood of film. Todd McCarthy's introduction provides an overview of Alton's biography and career and explores the influence of his work on contemporary cinematography and the foreword, written expressly for this edition by award-winning cinematographer John Bailey, explores Alton's often contentious relationships with colleagues, the American Society of Cinematographers, and the movie industry itself.